Father’s Day came this year and as usual I missed my Father. He’s been gone for a few years now and something always happens on that day that makes me shed a tear remembering the times we had. And this year was no exception. I always remember hunting and fishing, of course but this year I thought of working on pole barns with him and pouring concrete. He introduced me to this neat little tool, when I was sixteen years old called the Jackhammer. My job was to break up and clean out the concrete that occupied the holes we were planning to reuse for poles in the construction of a pole barn at a golf course. I thought it was real cool until I tried to pull it out of the hole and hit the trigger. I think I can still feel my teeth clacking together to this day. This Father’s Day was a little different as I had the opportunity to take my son Jeff and two of his three boys fishing, all at the same time. Now the boys are two and four and as you might guess they both have a rather short attention span, but being boys they relish the idea of fishing because it involves water and the possibility of getting dirty. We packed up the gear and ventured to the creek with the boys dressed in shorts and flip flops. Now, I know what you’re thinking. Why in the world would you take your grandkids fishing at the creek in such attire, what with bugs and ticks and all? Well, I forgot to mention the creek runs behind my friend Don’s house and he mows right up to the water line. Plus it is in town just two minutes from my house. This is one of those waterways that snakes through drainage ditches until it forms a pretty little pond in a better part of town complete with Geese and Goldfish. This creek has a seemingly unlimited supply of perch that just love little chunks of worm and are more than willing to thrill a couple of little boys out to slay them with Spiderman poles. We stayed about an hour, which I thought was very good for the age they were but they were really intent on catching fish. We returned our catch to the water each time and amassed a catch of about a zillion or so. We honestly lost count, which is odd for me since I am one of those crazy people who feels the need to count things, especially fish. I am keeping a journal or actually more of a logbook here lately to see just how many fish I can catch in a year. I wondered what the count was up to the other day so I added them all up and was somewhat impressed with the total, as you might be as well. Anyway, that’s enough of that. I sat and held Ivan, the youngest on my lap and taught him how to reel in his catch. He learned very quickly and soon he was able to work that reel like a pro and reel a fish right up to the tip of the rod. I guess we never see pro’s do that but anyway he thought that’s where they needed to end up. Each time I removed the barbless hook he would put his little hand under the fish in the palm of my hand and give him a flip back in to the water. And of course his big brother, who was fishing with his daddy a few feet away, had this fishing thing down as he had been fishing before. They both got poked a bit from the fish fins and, I think learned to respect the fish somewhat without being afraid to touch it. It was a fun time teaching kids to do something for the first time and watching them catch on and do it for themselves. I guess it just goes to show we can all learn from our dads, or granddads for that matter whether it’s how to hold a fish, run a jackhammer or finish concrete. 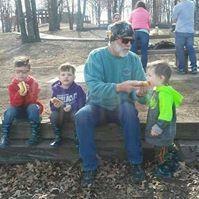 I wished my dad could have been there to see his great grandsons catch fish for the first time. And then I realized he kind of was there in a sense as I showed my son what my Dad showed me and we passed it along to the little ones. So Father’s Day this year was a special one as I heard from all my boys and my “adopted” daughter, fished with kids and remembered my own Dad. I think I will try to have another one real soon.